Tariff ~ King's Room, £105 per night; Duke of Beaufort's Chamber, £95 per night. The castle is historically a family home, though guests are warmly welcomed to share in Gwydir's tranquil and timeless atmosphere and languish by a log fire in one of the candle-lit halls. Situated in the foot-hills of Snowdonia, three miles from Betws-y-Coed and twelve miles from the medieval walled town of Conwy, Gwydir Castle is perfectly situated for the enjoyment of all the natural and historic wonders of North Wales. The castle is within pleasant walking distance of the market town of Llanrwst, with convenient rail and bus connections. There are also several good restaurants and inns in the vicinity for dinner. Two rooms are available, the 'King's Room,' with its en-suite bathroom, and the 'Duke of Beaufort's Chamber,' with its own private bathroom adjacent. Both rooms have four-poster beds and garden views. The bedrooms are furnished with antiques and, whilst retaining their historic charm, have all the (discreet) concessions to comfort and modernity that the gentle traveller might require. 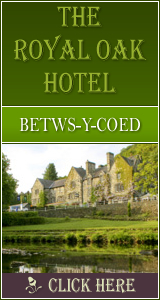 Rates are for two people per room and include Full Welsh Breakfast. In addition, a visit to the areas of the castle open to the public is included in the rate. For reservations, please contact us: details are to be found on the `Contact' page of the website. 483 Click Throughs => �241.5 Since 13/May/2013 based on an example �0.50 cost of a click through from Google pay per click. The click through ratio to this accommodation provider's own website Since 13/May/2013 is 24% .